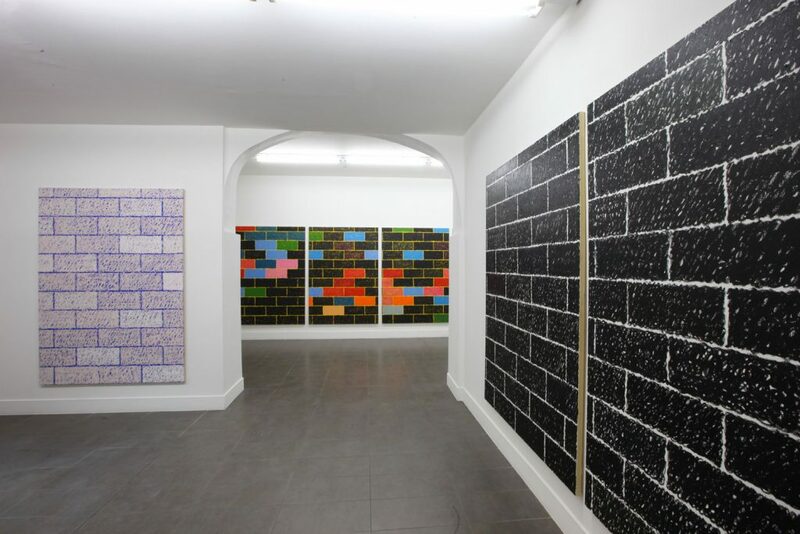 Brand New Gallery presents Blurred Lines, Paul Anthony Smith’s first European solo show. The exhibition will feature a group of large-scale paintings from Smith’s most recent body of work. 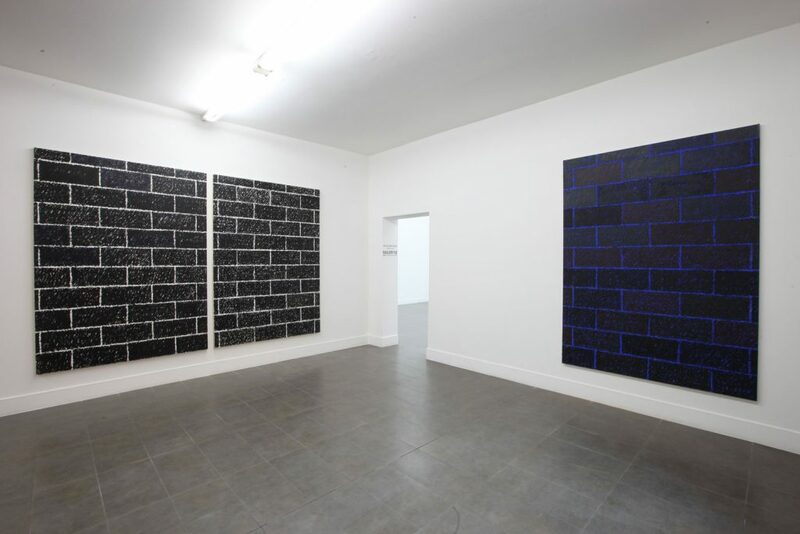 In Blurred Lines, Smith employs the use of drawing, layering cinderblocks to create walls of blurred lines. 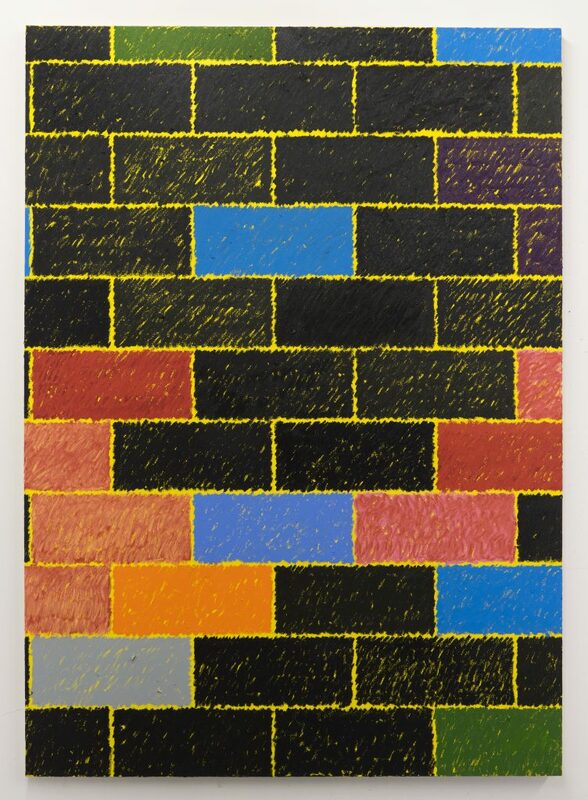 Smith continues the exploration of image manipulation, camouflaging ideas of nostalgia: how images are broken down into pixelated color blocks as a disguise to form walls. His process started with 6 large photographs, which have been used in previous works. 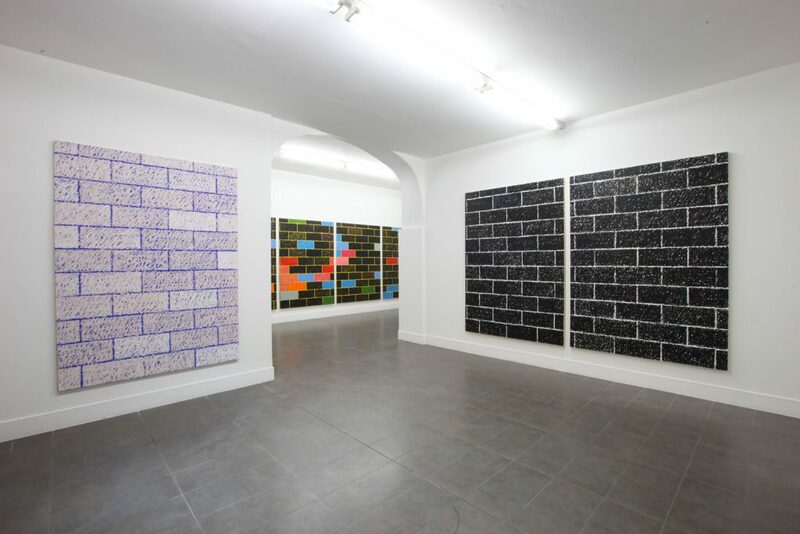 He painted cinder blocks on the photographs themselves —drawing with oil sticks, choosing colors corresponding to the photographs (in effect, turning a digital pixel into a handmade, expressive gesture). Then, using these prints as reference sketches, he recreated the cinder block pattern in the same colors drawing on canvases with a painted underlayer of white, blue, or bright yellow. This yellow color is of special significance to Jamaican cultures, notably the mango, commonly found on trees throughout the island. If someone has a mango tree, they will put any extra fruit out on their fence, often cinder block walls, for any passersby to take — making it a symbol of community in Jamaica, as opposed to its status as an expensive luxury item in the developed world. Many of the bricks are black — however, they are all different shades of black (mixed with reds, greens, etc. ), and this subtlety is hard to perceive on first glance. Smith is very aware of the political overtones. 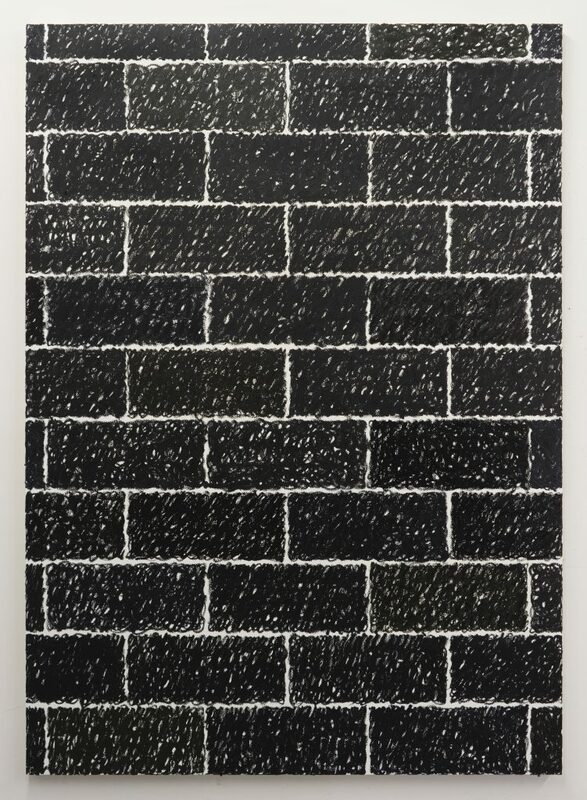 The title “Blurred Lines” refers to both his mark-making as well as the blurred distinctions in contemporary culture and politics — including gun laws, tragedies across America, and ongoing immigration laws concerning the US-Mexico border. Paul Anthony Smith ‘Blurred Lines’ Installation view at Brand New Gallery. Courtesy of Brand New Gallery. Oil sticks and polymer paint on canvas, 80 × 64 in, 203.2 × 162.6 cm. Courtesy Brand New Gallery. Oil sticks and polymer paint on canvas, 84 × 60 in, 213.4 × 152.4 cm. Courtesy Brand New Gallery. 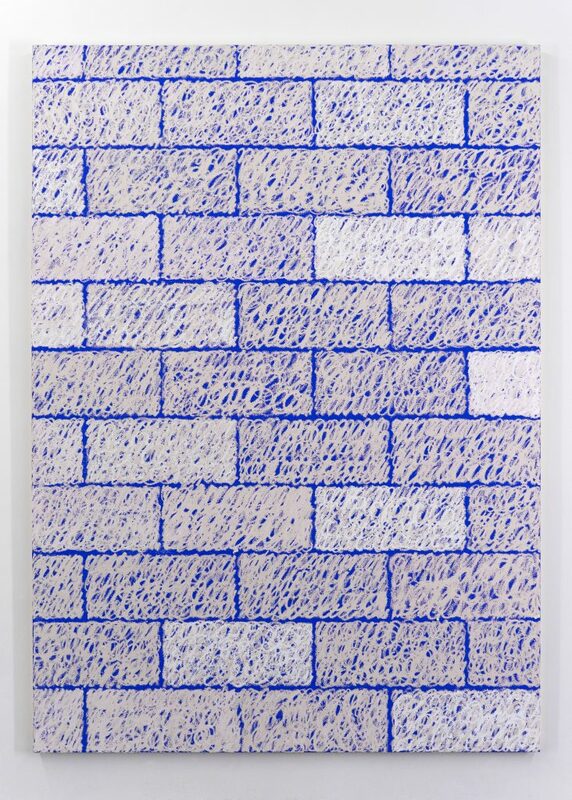 Oil sticks and chroma key blue on canvas, 84 × 60 in, 213.4 × 152.4 cm. Courtesy Brand New Gallery.